A total of 13 adult elephants are expected to be fitted with satellite collars in Mikumi National Park and Selous Game Reserve in Tanzania during the first two weeks of September. The completion of this exercise will have a total of 20GPS satellite collars fitted on adult elephants within and outside core areas of Selous Ecosystem. 13 adult elephants are expected to be fitted with satellite collars in Mikumi National Park and Selous Game Reserve in Tanzania during the first two weeks of September. The completion of this exercise will make a total of 20 GPS satellite collars fitted on adult elephants within and outside core areas of Selous Ecosystem. The fitting of satellite collars with improved technology, will facilitate the collection of real time data for their effective monitoring and ensure security to large mammal movements and especially the elephants that have, in recent years, been challenged by poaching. The fitted GPS collars will also strengthen elephant conservation efforts in Selous Game Reserve by alerting rangers and field teams where each elephant family with elephants fitted with GPS collars are heading to and help move them away from cropland and reduce the risk of human-elephant conflicts. It will also identify critical habitats, seasonal dispersal areas and corridors for elephants that may require enhanced protection. Selous once supported over 90,000 elephants but the population was reduced to less than 15,000 by 2014 due to poaching and illegal ivory trade with China being the major market. However China has shown its commitment to the fight against poaching by closing all the ivory market. WWF Tanzania Country Director Dr. Amani Ngusaru explains that WWF is supporting Selous Game Reserve to attain zero poaching. “We are excited to be part of this important exercise and to support the government’s efforts in the conservation of elephants in the country. The use of satellite collars technology is proven as an effective measure to monitor wildlife movements and at providing a security function. We at WWF hope that this exercise will enhance the security that is needed to protect elephants especially from poaching. The Greater Selous ecosystem requires special attention of all concerned conservation partners because it is the only area that can guarantee a sufficient space for elephants and other wildlife but it is also of ecological importance because it is home to huge, diverse and exceptional Miombo and Savanna ecosystem as well as a designated World Heritage Site by UNESCO. The collaring exercise which began in December 2017 targeting 60 elephants is being done in phases dictated by prevailing weather conditions. Only one elephant will be collared in a herd; elephants found in Wildlife Management Areas or outside core protected areas will be preferred to be fitted a unit than those in a core area. Some results that have been received from the seven previously collared elephants are interesting. There are two very active elephants: one in the Selous and one that moves in and out of the Selous visiting village land in the east. This family group of elephants is causing sleepless nights to villagers so resources are being mobilised to stop the elephants entering cultivated areas in the villages. During this phase collaring will be supported by a helicopter and with an estimated planned total of 34 hours flying time in Mikumi and Selous’ Miguruwe, Liwale, Kalulu, Likuyu-Seka and Liwale sectors. WWF has supported Tanzania Wildlife Management Authority (TAWA) through Tanzania Wildlife Research Institute (TAWIRI) to fit GPS satellite collars in Selous Game Reserve because through its expansive nature of the wilderness it has immense potential for harbouring huge numbers of elephants as a springboard for increased tourism growth to support an expanded sustainable socio-economic development in the country. 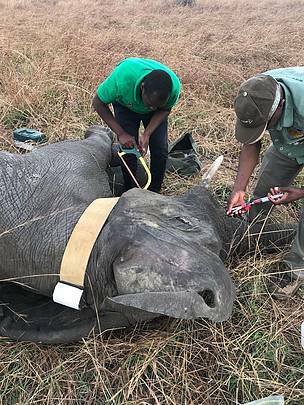 In the last two collaring exercises the GPS satellite collars were fitted to elephants in Matambwe sector in Selous Game Reserve and Mikumi National Park. WWF has worked with other expert organizations to produce a zero poaching toolkit which clearly sets out the actions needed to control poaching. This has been successful in Nepal and a number of other countries are starting to adopt this process to stop elephant poaching including Tanzania after WWF facilitated a high level government delegation from East Africa to Nepal to learn about zero poaching strategy. The toolkit highlights six pillars that underpin it. In the Selous WWF is focused on three pillars namely: the community, increased prosecution for wildlife crimes and increased ranger capacity in combating poaching in the Selous.